A ubiquitous figure in the realm of martial arts, action star and Aikido master Steven Seagal has claimed to have taught some things to the newly-minted UFC light heavyweight champion Daniel Cormier as well as been beside legends Anderson Silva and Lyoto Machida when they enter the Octagon. He’s a mystic of the scene. Perhaps subjected to unfair scrutiny from the universal naysayers of the web, the way in which Seagal at times portrays himself is somewhat misleading, seemingly hyperbolic. 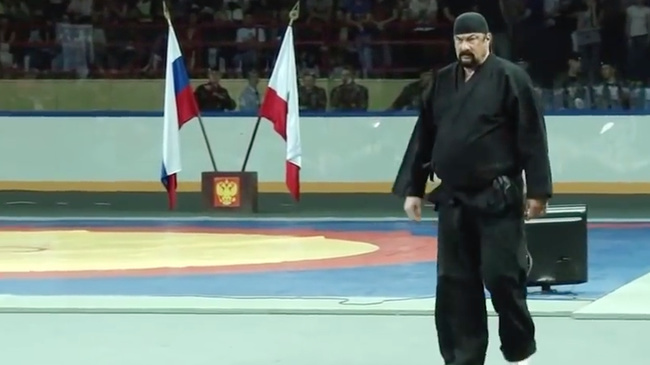 To perhaps dispel some misconceived doubts, he gave a seminar to a large Russian audience in his discipline, Aikido, in which he holds a seventh degree black-belt. See the (scripted?) action in the video below.